Fans and footballers often have a volatile relationship. We’re either worshipping them like some pagan god or we’re dishing out the kind of abuse normally only reserved for folk who leave court handcuffed and with a blanket over their head. And then there is the violence. Rab Douglas was the latest to be attacked by crazed fans at the weekend as the Forfar keeper celebrated a win. By all accounts he gave back as good as he got but it wasn’t his first brush with deranged and seething supporters. In a tempestuous Old Firm fixture at Parkhead the home fans threw bottles, coins and pies at the director’s box before turning their frustrations on Rangers goalkeeper Ally Maxwell. Unfortunately for the would-be assailant he wasn’t quite quick enough as Gers defender John Brown abruptly stopped him in his tracks before he was able to reach his intended target. The Brazilian goalkeeper theatrically collapses to the ground and is then stretchered off the pitch after a Celtic fan playfully slapped him on the shoulder following Scott McDonald’s Champions League dramatic winner at Parkhead. The incident earned Celtic a £25,000 fine from UEFA while the European governing body dished out a two-match ban to Dida for play acting. The ex-Celtic manager had a fortunate escape when a nutcase Hearts supporter ran out from behind the dugout and tried to attack him on the touchline. The police were on hand to restrain John Wilson before he could land a serious blow. Surprisingly the case of assault against Wilson was found Not Proven at Edinburgh Sheriff Court. But the halfwit was jailed for breach of the peace. Partick Thistle were training at a Glasgow Park when two neds turned up with a devil dog, brandishing samurai swords. Charnley took them on with a traffic cone and his bare fists and while he was slashed on the hand during the ensuing struggle he did manage to disarm the two attackers. A famous victory for Dundee at Tannadice in the 100th league derby between the bitter rivals was marred by a post-match pitch invasion. Douglas was the victim of an attempted assault but the idiotic Dundee United fan came off second best when the big Dark Blues keeper wrestled him to the ground. 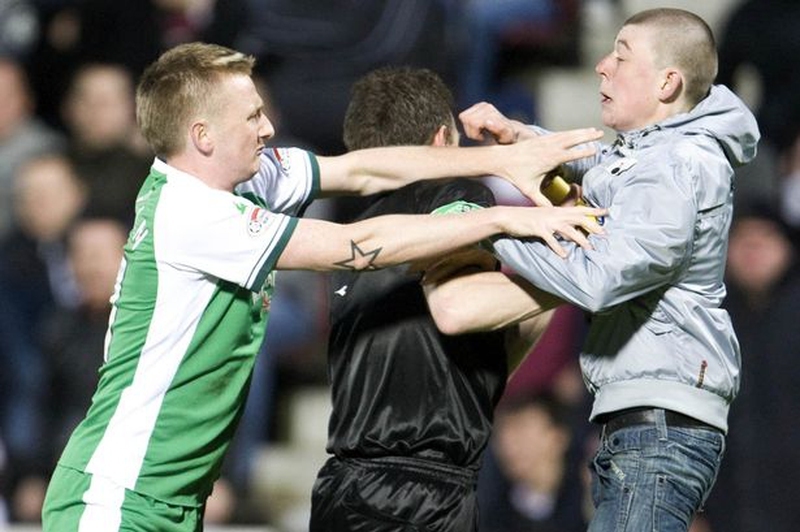 A Hearts fan invaded the pitch and tried to attack the Hibs forward after he netted a late winner at Tynecastle. Referee Steve Conroy came to Riordan’s rescue when he got between the player and the moron who ran on to the park. I mean, imagine going after a guy who had been banned from every single nightclub in the capital. The AZ Alkmaar keeper was sent off after scissor kicking a drunken thug who tired to attack him during a Dutch Cup clash with Ajax. Alvarado knocked the hooligan to the ground and landed a few more blows for good measure before security guards intervened. His red card was later rescinded. Almost three decades before he became Hoops manager Strachan was attacked by a Celtic fan while he was playing for Aberdeen. Strachan was minding his own business on the right wing during a 2-0 victory when a punter ran out of the Jungle and banjoed him. The former Nottingham Forest manager slaps two of his own supporters on the back of the head after they ran on the pitch to celebrate a 5-2 home win over QPR. To add insult to injury the pair are then summoned to the City Ground where they are forced to apologise and give Clough a kiss! Following his 48th-minute dismissal the Frenchman leapt into the crowd at Selhurst Park and kung-fu kicked Crystal Palace fan Matthew Simmons. The pair then traded punches before Cantona was hauled away by stewards and the Manchester United kitman. He was fined £200,000 by his club and banned from football for nine months by the FA. Server responsed at: 04/25/2019 2:20 a.m.